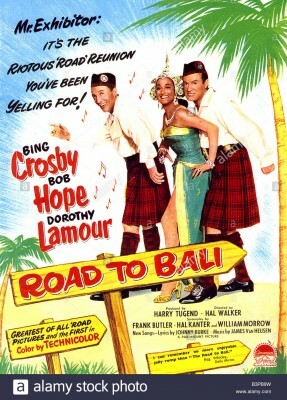 Road to Bali (1952) was the sixth of seven "Road" movies starring Bing Crosby and Bob Hope, following Road to Singapore (1940), Zanzibar (1941), Morocco (1942), Utopia (1946), and Rio (1947), all produced and released by Paramount Pictures. The seventh and final film, The Road to Hong Kong (1962), was released through United Artists. The Road movies were lavish productions, comedies with musical numbers (as opposed to musical-comedies) all working from the same basic premise. Perennially broke and stranded, Hope and Crosby were typically third-rate song and dance and/or confidence men, with Bing the smarter and shiftier of the two. Looking for passage back home they'd stumble onto some fortune-hunting scheme that invariably had agreeably unscrupulous Bing unhesitatingly sacrificing pal Bob's safety. Hope lasciviously lusted after every beautiful woman in sight and they always competed for the affections of their glamorous leading lady (Dorothy Lamour in the first six movies, Joan Collins in the last). Though never officially a duo act, the Hope-Crosby Road movies were better appointed than anything made by the Marx Bros., Abbott & Costello, and other comedy teams, and consistently successful and well reviewed. They were also unusual, even groundbreaking comedies in that they were among the earliest comedies to regularly "break the fourth wall" and have cast members directly address the movie audience, to break character with in-jokes about themselves, other actors and movies, and Paramount Pictures itself. The plots were immaterial and rarely had anything to do with locations in which they were set. Rather, these were deliberately Hollywood-stylized exaggerations that, in one sense, spoofed non-comic but otherwise likeminded exotic melodramas. Road to Bali is the only one in (Techni)color, but it (along with Rio) fell into the public domain, apparently after being improperly renewed in 1981. For years after it was widely available but always looked pretty terrible. BCI Eclipse released an excellent HD DVD double-bill of Bali and Rio in early 2008, but it's taken nearly a decade for it to come out on Blu-ray. The plot, such as it is, strands American vaudevillians George (Crosby) and Harold (Hope) in Melbourne, Australia. After running out on two sets of farmer's daughters and their families, George "volunteers" Harold for a suicidal underwater salvage job, to retrieve a treasure chest of jewels, on behalf of a native prince (Murvyn Vye) planning to usurp the crown from half-Scottish Princess Lala (Dorothy Lamour). After Harold tangles with a gigantic squid and retrieves the treasure he, George, and the princess find themselves shipwrecked on an island paradise while en route to Bali. Cannibals, however, populate the island. Or are they merely headhunters? Does it matter? By this point the Road series had become almost ritualistic. Running gags about Hope's ski slope-like nose and (supposed) hammy and vain attempts to win an Oscar, and Bing's singing career abound. The movie is rife with cameos toward the end, and Hope and Crosby once again resort to their signature "patty cake" routine to get out of a jam. The series slowly built up steam through its first three entries, peaking with its fourth, Road to Utopia, the cleverest and funniest of the pack. Bali is more leisurely and less innovative, but the gorgeous use of Technicolor exemplifies the level of class Paramount was still pouring into these pictures. (Coincidentally, the story shares elements with Abbott & Costello's earlier Africa Screams from 1949, made for probably one-fifth Bali's cost.) The production design, credited to J. McMilian Johnson and Hal Pereira (set decoration by Sam Comer and Ross Dowd) is especially good, with wildly over-the-top South Seas exotica, including several impressive ceilinged sets. Kino's Blu-ray looks identical from what I recall of BCI's earlier HD DVD release. The colors pop significantly most of the time, despite a couple of misaligned matrix shots here and there, and the sharpness of this three-strip Technicolor production is generally excellent. The 2.0 mono DTS-HD Master Audio is likewise great. No subtitle options on this region "A" encoded disc. The lone supplement is a marvelous audio commentary track by Michael Schlesinger and Mark Evanier, two of the three participants in Criterion's It's a Mad Mad Mad Mad World Blu-ray, one of the best-ever commentary tracks to date. As there, on Bali they help put the film into cultural, historical, and industrial perspective, and provide loads of background information on actors and gags that changing times have slipped out of the general public consciousness. It's a wonderfully witty and informative track, worth the price of the disc all by itself. Loads of fun and a feast for the eyes and ears, further supplemented by a wonderful audio commentary track, Road to Bali is a DVD Talk Collector Series title.